Chemical cleaners aren’t always your best bet. They linger in the air, don’t smell so great and can cost a lot of money. You’ll be amazed at just how much you can do with some simple lemon juice and white vinegar. Does your cutting board still smell like onions after a scrub-down? There’s an easy solution for that and it won’t leave any chemicals where you chop your veggies. Cut a lemon in half, squeeze the juice over the board and rub it in using the lemon half. Let the juice sit for 20-30 minutes and then rinse. The best part is that this doesn’t just kill odors – it can lift stains, too! Is your Tupperware stained and holding onto food smells after storing tomato sauce? 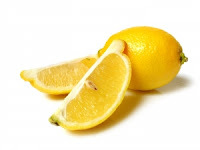 Simply rub a lemon slice over it and leave it in a sunny window for all natural bleaching and de-odorizing. Have ants invaded your home? If you hate to use poison indoors, you’re in luck because ants absolutely hate citrus! Just rub down the bottom of your doorways with some lemon juice! If you use a humidifier, a few teaspoons of lemon juice in the water will keep it from getting musty while adding a nice citrus note to the air. We’ve all forgotten a load of laundry in the washer at some point. White vinegar is your best friend when this happens because it can take care of that musty smell fast. Add 1 Cup to the load you’re re-washing and you’ve got your second chance at fresh laundry! Vinegar is also a natural fabric softener and will strip away detergent build-up, so it doesn’t hurt to add some to the wash every time! Vinegar can also conquer smells lingering in the air. Musty basements, skunk spray from outside, fresh paint odors or lingering burnt smells in the kitchen will be absorbed within 24 hours if you just leave out a bowl of white vinegar. For a spill-proof solution, you can also soak a slice of white bread with vinegar and leave that out on a plate. Either way, you’ll be amazed at how vinegar eats odors. Are the bricks on your fireplace surround looking dingy and soot-stained? Give the bricks a good scrub with a stiff-bristled brush and full strength white vinegar, then finish by rinsing with water. Vinegar is also amazing at removing white rings left behind on wood furniture by a wet glass. Mix equal parts vinegar and olive oil and use a cloth to rub it onto the wood, following the wood’s grain. Then just polish it up with a clean cloth!